Smurfs: The Lost Village isn’t a very good movie but being aimed at younger audiences, and I suppose Smurfs purists, it’s fine a time-waster and at least does have a nice message to it. 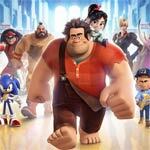 Wreck-it-Ralph is a great animated-comedy-adventure the entire family will enjoy and, at least for the past couple of years, rivals some of Pixar’s own works. It’s a fresh and imaginative story and the animation is wonderful. That being said, while the audio/video transfers are phenomenal, this unfortunately did not get the same treatment as most Pixar home releases do in terms of features. There’s a nice making-of featurette but its standard and the deleted scenes aren’t anything amazing. However, if solely buying based on the movie (who in the hell does that anymore?!?! ), its well worth the purchase price.